Paid Search Engine Marketing Company - Dharne & Co.
SEM or Search Engine Marketing is a type of paid Internet marketing associated with the researching, submitting and positioning of a website within search engines to achieve maximum visibility. Thus to increase your share of paid and/or organic traffic referrals from search engines. Creating fabulous content is meaningless unless your website is visible to users. This implies that your website should show up for user search queries when they type a relevant key phrase in their search engine window. This is exactly where paid search engine marketing is a lifesaver for small firms. Small sized businesses cannot compete with the big fishes as neither do they have a marketing budget like them nor an online recognition. In the digital era unless your result is available in real time, your prospects have diverted elsewhere. Thus, the only way a new business can compete with the big ones is through paid marketing. 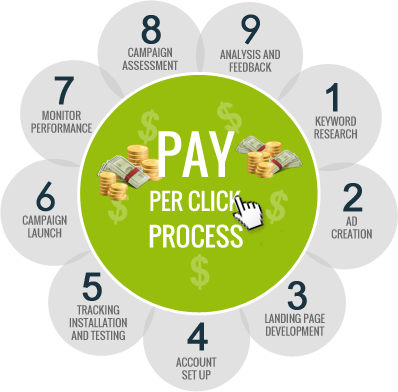 Be it Pay-per-Click(PPC) or Google Advert, all such mediums are one of the best ways to achieve very high ROIs. Paid Search Engine Marketing continues to be one of the fastest growing advertising media year after year. As consumers move to shopping at websites instead of stores, reading blogs instead of magazines, and watching videos via online channels instead of television channels, tapping into the audience for your products or services where they are currently “live at” is more important than ever.